Subject: Plate: 'Scene de la critique de l'ecole des femmes.' 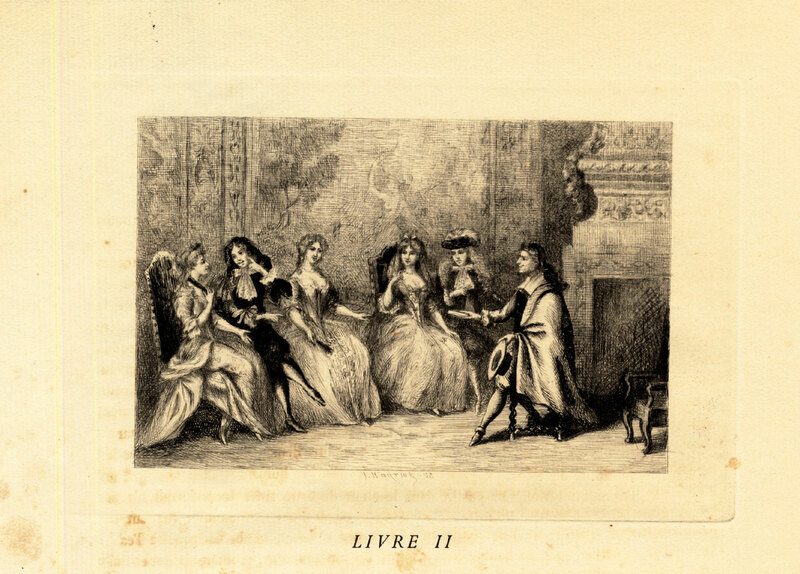 This plate shows a scene from a theatrical play by Moliere with from left to right: Elise, Dorante, Mlle. De Brie, Mlle du Parc, the Marquis and the poet Lysidas. Text on both sides. Condition: Excellent. General age related toning. Irregular edges as issued with small tears. Some small spots outside the image. Please study scan carefully. Size (in cm): The overall size is ca. 32 x 44.5 cm. The image size is ca. 15 x 10 cm. Size (in inch): The overall size is ca. 12.6 x 17.5 inch. The image size is ca. 5.9 x 3.9 inch.